stir in spices and zest. When just hot, add peaches, and reduce heat to simmer. 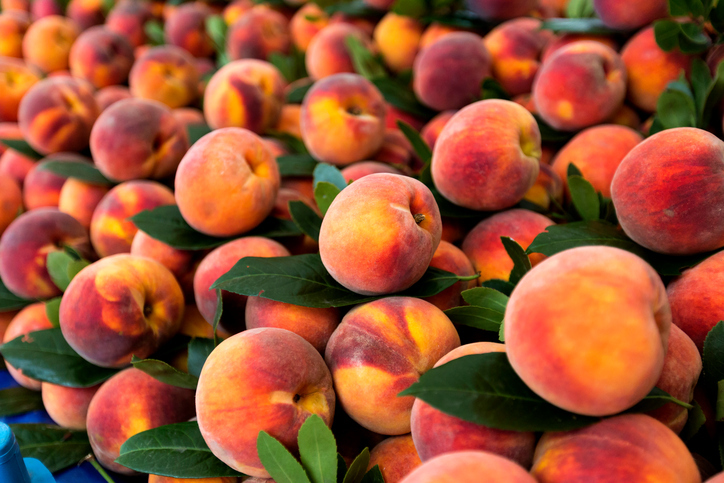 Poach peaches in liquid for 15-20 minutes, and remove from heat. Cool peaches in liquid, cover, and chill until serving. Serve in dessert bowls, with choice of dippers, anytime of day. Sublime pretty much accurately describes this simple, incredibly delicious little dessert ... especially if you have good dippers, which (of course) I address at the end of the story. Before the bumper crop of summer fruit leaves our experience, consider this little something sweet as the perfect finish to alfresco suppers, weekend barbecues, midnight snacking. Even better, it makes the start of a good day suddenly turn great. It's my breakfast on very warm summer mornings! My guests at BarComida these last couple weeks have not only enjoyed these peaches as a dessert, I have even gone so far to place them between prosciutto and mascarpone on toasted brioche, for a delicious little tapas sandwich. It's a crowd- pleaser! 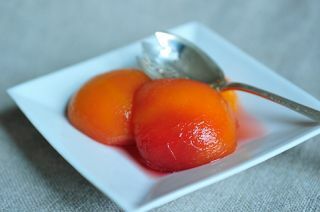 For dessert, I serve the peaches poached in a sweet white wine syrup with a little spice and hint of citrus, which is the recipe above. Other variations could include using Amaretto, which makes them particularly romantic if you are so inclined (and I was, for the muse that was my inspiration). If you would like to use red wine and poach cherries, plums, and other darker-flesh stone fruit recipe of mine that was rated obscene (in the best and cleanest of ways) by one friend who loved it and suggested that it tasted like a sweet, syrupy Sangria. In the red wine syrup, my favorite fruits to use are cherries and white nectarines. As for the dippers ~ a very important component of this spectacular little dessert ~ my spicy gingersnaps have been very well-received! Brioche (or challah) cinnamon toast pieces are also incredibly delicious, as are any type of Italian almond or anise biscotti or pizzelle. In the red wine recipe, I make cinnamon foccacia cut in strips for dipping; that combination was the one that inspired the obsence comment. Just sayin'. For breakfast, I love this topped with crushed toasted almonds and plain or vanilla yogurt, and usually cinnamon toast strips are the perfect dippers. Try this at home, for your own romantic outings, family, summer guests, or just for you. One recipe yields about 6 servings when sharing, and about 2 servings when ... hoarding.